FOX AND HIS FRIENDS (1975), one of Rainer Werner Fassbinder’s very few films with a queer protagonist, pits the title character (played by Fassbinder himself)—a hapless, clueless circus performer who has just won the lottery—against the imperatives of the sleek, educated gays he suddenly has access to. In addition to Fassbinder, FOX stars Peter Chatel as Fox’s social-climbing lover, Harry Baer as Fox’s rival, and El Hedi ben Salem (Fassinder’s real-life lover) as a Moroccan hustler. Cinematography by Michael Ballhaus. FOX AND HIS FRIENDS, Thursday, June 8 at 7:30 pm. CINEFAMILY, 611 North Fairfax, Los Angeles. 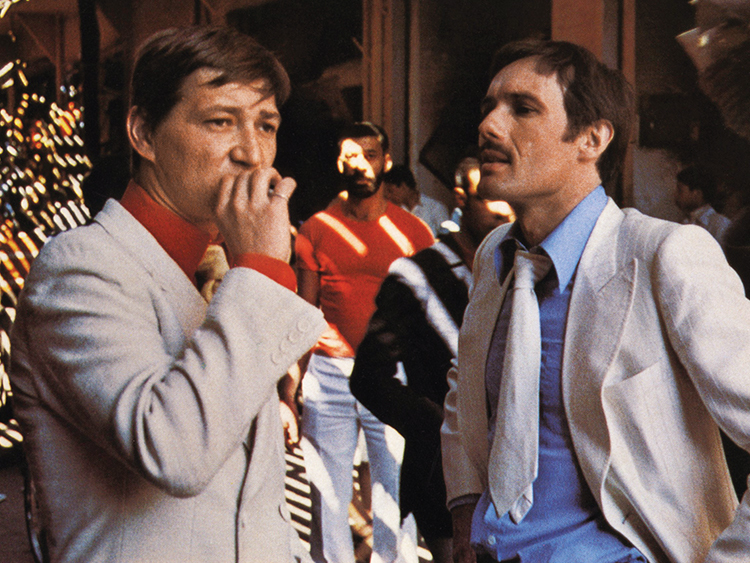 Rainer Werner Fassbinder (left) and Peter Chatel in Fox and His Friends. Image credits: The Criterion Collection, and Slant. This entry was posted in FILM and tagged Armond White, Cinefamily, El Hedi ben Salem, Fox and His Friends, Harry Baer, Michael Ballhaus, Peter Chatel, Rainer Werner Fassbinder on June 6th, 2017 by Barlo Perry.